If you’ve ever wanted to take your Wild Apricot account above and beyond the features we currently offer, our new integration with Integromat could help you do just that. 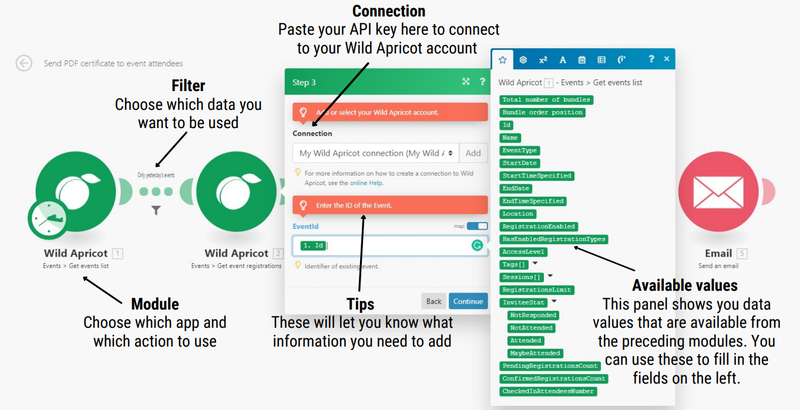 In December 2018 we launched a Wild Apricot app on Integromat, a tool that allows you to connect the different software you use. This gives you hundreds of possibilities for different scenarios you can set up! Read on to find out what you can do and how to get started. Integromat is a tool you can use to automate manual processes, without needing to write any code. With Integromat, you can set up ‘scenarios’ (sequences of steps) that will connect between apps and run automatically to get tasks done, both in Wild Apricot and in over 230 other apps and services. What Can You Do with Integromat? In short, you can automate series of tasks that use any number of the apps Integromat is linked to. You can find the full list here. That might mean using an action that happens in Wild Apricot as a trigger to carry out other actions, like sending a push notification to Android or Apple phones or posting in your Facebook group. Or you could set up a scenario where an action in another program triggers actions in Wild Apricot, such as updating contact details or creating an invoice. For a guide to setting up a scenario in Integromat, see this post. Who Will Find Integromat Most Helpful? If there are advanced or highly specific functions you’d like to do with Wild Apricot but that aren’t currently possible. If you use other software programs alongside Wild Apricot, e.g. QuickBooks Online or Gmail — particularly if you’re currently manually transferring data between them. If you have a large membership base and a small team of staff and volunteers — or if you’d just like to save some more time by automating more of your tasks. If you’re not a coder — that’s ok! Integromat is designed to use drag and drop modules so you don’t have to write a single line of code. That said, if you’re creating your own scenarios it’s helpful if you’re familiar with functions. Integromat uses similar functions to those you might find in Excel or other programming languages. ...and lots more. You can check out all the apps Integromat integrates with (it’s a lot!) here. 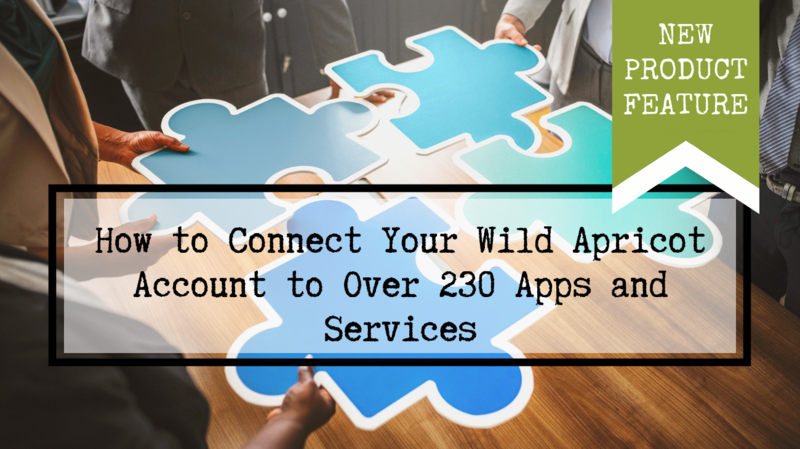 To integrate with these apps, you’ll need an account with them — many are free, and some you might already have, but some do charge a fee to sign up. To get you started, we’ve set up 4 templates on Integromat using Wild Apricot. These templates automate actions that have been requested in our Wishlist Forum. Once you’ve signed up for an Integromat account and connected it with your Wild Apricot account (see below for details on how to do that), it only takes a few clicks to start trying these templates out. Set up an Integromat account. Authorize Integromat as an external application in Wild Apricot. To set up an Integromat account, go to integromat.com and click the Sign up button. You can sign up for free or choose any of the paid plans. The Free plan allows you up to 1,000 operations a month — for small organizations running simple scenarios, this could be enough to cover everything you need. The Basic plan ($9 USD/mth) allows a maximum of 10,000 operations per month. For more information on Integromat plans, click here. Hover over the Settings menu and select the Security option. Within the Security settings screen, select the Authorized applications option. On the Authorized applications screen, click the Authorize application button. Enter ‘Integromat’ as the application name. Copy the API key and save it somewhere. You'll need it when you start using Integromat. Click the Full access option. You can find more details on setting up Integromat on our help page, by clicking here. With these two steps set up, you’re ready to start creating scenarios. Why not start with the pre-loaded templates, to get a sense for how the system works? The GIF below shows you how. Is it free to use Integromat? You can sign up to Integromat for free — if you’re only running a few scenarios, the free plan might cover all your requirements. However, if you’re running lots of scenarios, you may need to upgrade to a paid plan — these start at $9 per month. Find out more about pricing here. I’ve never worked with APIs before — will I be able to use Integromat? Integromat has been designed to make using APIs as easy as possible. Once you’ve authorized Integromat as an application in your Wild Apricot account, all you need to do is copy and paste your API key to connect between your Wild Apricot and Integromat accounts. Our help page walks you through how to do this step by step. If you have any questions on authorizing Integromat as an application in Wild Apricot, feel free to get in touch with our support team. If you have questions about using Integromat, you can find more information via the links above, or get in touch with their support team directly. I'd love some more specific help with using this. Like - how to get event registrants into a Google Sheet so that they can be Zap'd into Gotowebinar. I keep getting errors. Been having a lot of fun fun Integromat. Glad to hear you've been getting on well with Integromat! Thanks for your feedback - I've passed your suggestions on to our team who work on the Integromat integration. Reviewing the Integromat integration module, I see that I can create an invoice. Is there any way at all to also apply a payment to an invoice? I'm looking for a way to trigger an Integromat scenario when a member renews. The best way I can think of so far is to use the Contact Modified trigger and then search for a changed field, but I can't seem to find a field that will reliably tell me whether the member has just renewed. Do you have a suggest or, if not, is there a detailed list of all the WA/Integromat triggers/actions and system fields? Nevermind! I figured it out with Invoice Created as the trigger and then using the Order Type value to filter. Hi Samuel, Good to hear you found a solution! We don't have a list of all the system fields, but there is a list of all the actions and triggers possible on this page: https://www.integromat.com/en/integrations/wild-apricot.